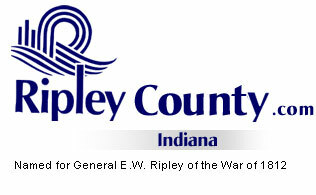 The Ripley County Council met on Tuesday, August 19th, 2003 at 7:00PM in the Ripley County Annex, Versailles, In. Donald Dunbar, President, called the meeting to order. Council members Don Dunbar, Edward Armbrecht, William Dramann, Lawrence Nickell, David Simon and Dephane Smith were present. Juanita Bauer was not in attendance due to illness. Neil Comer, Ripley County Attorney, was present to advise the board on legal matters. The Ripley County Council member Dephane Smith made a motion to approve minutes of July 15th, 2003 and seconded by council member Simon. Six members Smith, Armbrecht, Nickell, Simon, Dunbar &Dramann approved the motion. Council member Bauer was absent. Council Member Smith made the motion to approve the additional appropriation of $100,000 from County General for the commissioners (EMS Project). Seconded by Council Member Simon. Motion approved by (Five (5) Council Members (Dunbar, Simon, Nickel, Smith & Dramann. Council Member Armbrecht was opposed. Council Member Smith made the motion to approve the additional appropriation of $10,000 from Pretrial Diversion Fund for the Prosecuting Attorney, Richard Hertel. Council Member Nickel seconded the motion. Motion approved by all in attendance. Council Member Nickel made the motion to approve the additional appropriation of $166,000 from the Beltra Riverboat Fund seconded by Council Member Smith. Motion approved by Five (5) Council Members. Council Member Armbrecht was opposed. Council Member Armbrecht made the motion to approve the additional appropriation of $17,308.75 from the Riverboat Technology Fund for the new Low Tax/Financial System. Council Member Dramann seconded the motion. Motion approved by all in attendance. Council Member Armbrecht made the motion to transfer funds for the Ripley County Highway Department as follows: $12.80 from Stone #201-32490-000-026 to Cinders #201-28800-000-026, $81.44 from Lumber #201-32540-000-026 to Equipment Rental #201-32560-000-026, $174.01 from Bituminous #201-32520-000-026 to Dust Oil #201-32530-000-026, $5,000 from Unemployment #203-13400-000-033 to Insurance #203-13300-000-033, $160.92 from Bituminous #217-32520-000-217 to Stone #217-32490-000-217, $700.85 from Bridge Re-inspection #203-32620-000-033 to New Equipment #203-43100-000-033 seconded by Council Member Simon. Motion approved by all in attendance. Council Member Armbrecht made the motion to approve the transfer $219.60 from Environmental Travel #214-34802-000-036 to Ripley County Tobacco Grant Travel Expense #564-34800-000563 and seconded by Council Member Dramann. Motion approved by all in attendance. Council Member Armbrecht made the motion to approve the Salary Ordnance for the Ripley County Health Department/Ripley County Tobacco Prevention & Cessation Program (Data Management Clerk @ $11.00 per Hour & Project Coordinators (2) people @ $14.00 per Hour effective Jan. 1st,2003 seconded by Council Member Dramann. Motion approved by all in attendance. Council Member Smith made the motion to approve the transfer of $5000 from Part Time Prosecutor #260-12201-000-047 to Part Time Secretary #260-12402-000-047 seconded by Council Member Simon. Motion approved by all in attendance. Becky Reatherford, Soil & Water updated the council members on salary comparisons for District Administrator/Technician Salary to the surrounding counties and on other programs. Scott Melling, EMS Director advises the council on his progress and that he has a site near the Delaware area in mind and that the units all agree to the location. Don Dunbar, Council President presented to the council for their consideration a new percentage chart for the Riverboat Gaming & Edit breakdown. Council & Commissioners will have to meet and work on this project. No decision was made. Mary Ann McCoy, Auditor updated the council on the check for $167,713.62 for the 2003 Riverboat Wagering Tax Revenue Sharing Distribution that has been received from the Auditor of the State. This is the first Riverboat Wagering Tax Revenue Sharing Distribution that has been made. Council Member Armbrecht made the motion to adopt the Ordinance#14 establishing the Riverboat Wagering Tax Revenue Sharing Fund and seconded by Council Member Simon. Motion approved by all in attendance. Council Member Smith made the motion to sign the Resolution Election to Enlarge Participation in the Public Employees’ Retirement Fund for the Surveyor and seconded by Council Member Simon. Motion approved by all in attendance. Attorney Comer will prepare a new resolution for pretax payments to the Public Employees Retirement Fund for the council to sign at the next meeting. Economic Development/Chuck Folz advised they will be having a regular meeting on Aug. 20th at 12:00PM. Technology Committee/Edward Armbrecht reported that they are working on a 3 year plan. Also working on the Fire Alarm to connect with the Fire Dept/Sheriff’s Dept. and still in the progress of working on grants. E911 Advisory Board/Juanita Bauer not present due to health. SEI Regional Planning Committee/Dephane Smith nothing happen at the meeting. Grants Committee/Donald Dunbar reported working on a $50,000 grant for EMS Startup / $19,000 Video Arraignment grant and Technology grant for computers. Solid Waste District/Donald Dunbar reported a meeting would be held on Thursday night (Aug 21st). EMS Advisory Committee/Dephane Smith reported that the next meeting would be in Sept. Welfare Committee/William Dramann had no report. Council Member Smith made the motion to recess until the next meeting at 10:00AM, August 26th for the pre budget meeting in the Ripley County Annex Building Seconded by Council Member Nickel. Motion approved by all in attendance.